Daily Prompt: Tourist Trap Iceland is beautiful and definitely not a tourist trap! Photographers, artists, poets: show us VACATION. First, I’m sorry I haven’t been posting or even giving much attention to this blog lately. Everything is going fine, but I just haven’t felt led or been inspired to post. That changed this weekend, though, when we got back from our trip to Iceland. I’m inspired by some of the photos we took and will be working on a couple of future posts. But when I saw this Daily Prompt it seemed like perfect timing! Although it is the title of the Daily Prompt, Iceland is definitely not a tourist trap. It was a beautiful and great place for vacation! I really admire and respect the Icelanders because it looks like a difficult place to live. Everyone was kind and we had a very enjoyable visit and saw some amazing places. I’ve always been intrigued by Iceland, and also have always dreamed of seeing glaciers up close in person, the kind with that beautiful blue color floating in the water. I don’t have a ‘bucket list’ per se, but if I did, seeing glaciers like that would have been on it. And now that would be checked off as even better than I thought. The day we went there it was cold, windy and raining. 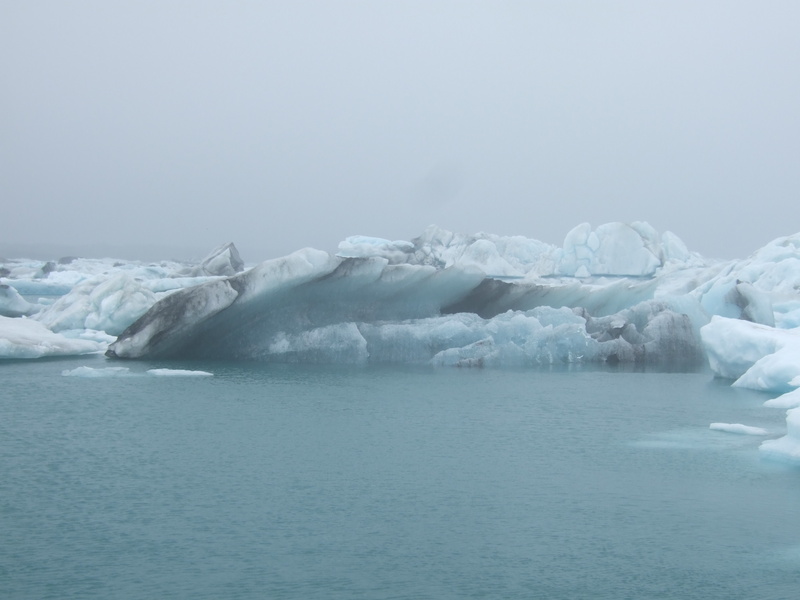 Now you’re probably thinking, helloooo… it’s Iceland, of course it was cold! True… but I was afraid they wouldn’t be giving tours out on the lake because of the weather. But, thankfully, that wasn’t a problem. Our guide soon explained that even though it was raining and we couldn’t see as far in the distance, the rain actually made the glaciers more colorful than on a dry day. What I feared would hinder us actually made them actually more beautiful. Have you ever noticed that sometimes what seems like an obstacle ends up being a blessing? My challenge is to remember that, even when I can’t see what lies ahead on the path. 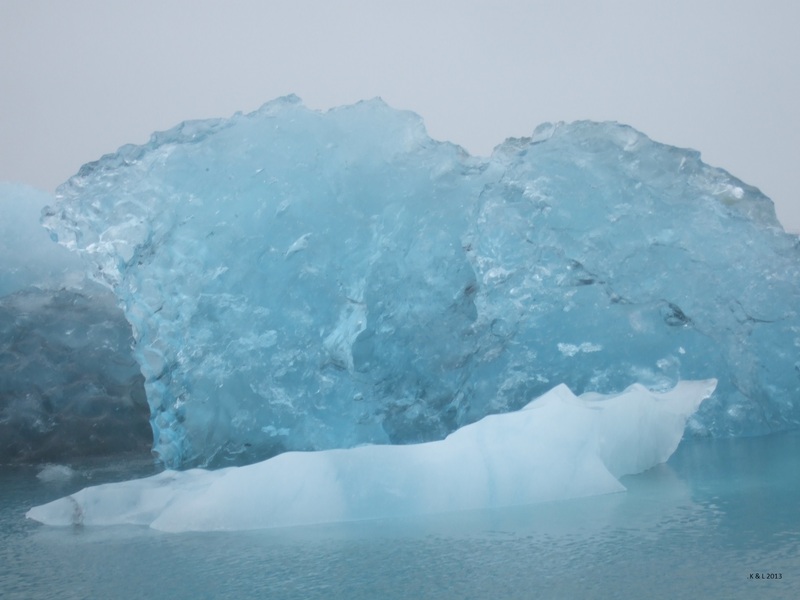 This entry was posted in Photos and tagged blue, Christian devotional, glacier, Iceland, Jökulsárlón, photo, postaday, travel. That’s what I hoped for at Jökulsárlon, last summer. Foggy weather!!! And so it was. ;) I was really happy as we arrived there in drizzle and no bad sight. The light was outstanding and the ice rocks looked so much more beautiful and unique than on a sunny day. Great shots, btw! Hey you’ve got some great photos on your blog, too. Love that you got some more artistic shots of the ice…I didn’t think of that. Those one-lane bridges look very familiar :-) Thanks so much for visiting! Great travel info on your blog! Thanks for stopping by.